The UN Verification Mission in Colombia's key task is to verify the reintegration into society of former FARC-EP members. 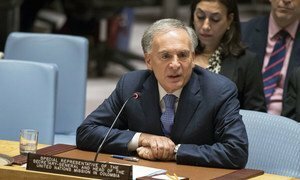 Amid a long series of challenges, the implementation of the peace process in Colombia is moving forward and has achieved important milestones in recent months, according to a new report by the United Nations Secretary-General presented to the Security Council on Thursday. On 20 July – Colombia’s Independence Day – as a new Congress was inaugurated, including representatives from the political party that has sprung out of the former FARC rebel movement, which waged a revolutionary struggle with government forces for more than 50 years, before signing a peace deal in 2016. “The presence of the political party FARC fulfills one of the core objectives of the final Peace Agreement, and this Congress is among the more diverse, plural and representative in the country's legislative history,” said Jean Arnault, Head of the UN Verification Mission in Colombia, which was set up nearly two years ago, to monitor and support implementation of the peace deal. He added however that “while participation of FARC representatives in the Congress is a major step, reintegration into civilian life of former FARC-EP members is very much unfinished business,” noting that successful reintegration will “no doubt require dedication and resources”. According to the report, “the fundamental goal of providing income-generating opportunities for 14,000 former combatants is far from being realized”. However, the Government made “the welcome decision” to extend food assistance to the territorial areas for training and reintegration until the end of 2018. In addition to the fear and frustration expressed by some former combatants regarding a peace process they feel has not lived up to expectations, the report lays out other issues which President-elect Iván Duque, set to take office on 7 August, will have to address in order to bridge the divisions among the Colombian people: the proliferation of new illegal groups; the continued growth of the coca economy; and the ongoing violence in certain areas, especially against community leaders and human rights advocates. In his briefing, the Head of the Verification Mission recognised the importance of the national “Pact of repudiation of violence against social leaders” signed by President Santos and President-elect Duque. “It is the first time that violence against social leaders is received with such a strong sense of outrage, expressed in the streets of Colombia and cities abroad, in the halls of national institutions and across the political spectrum,” he said, calling this national consensus against attacks on local figureheads “significant”. Mr. Arnault reiterated that the newly elected authorities can count on the support of the Verification Mission and stressed that “supporting institutions in their efforts to curb the violence in the territories will remain a top priority”. 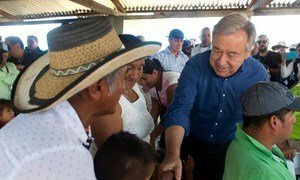 On the second day of an official visit to Colombia, United Nations Secretary-General António Guterres on Sunday expressed hopes for the future and for the peace process in the South American country.